• Objects and evidence from some of the UK’s most notorious crimes including the ‘Acid Bath Murder’ of 1949, the ‘Great Train Robbery’ of 1963 and the ‘Millennium Dome Diamond Heist’ of 2000 will go on show at the Museum of London from Saturday. Created with the support of the Metropolitan Police Service and the Mayor’s Office for Policing and Crime, The Crime Museum Uncovered exhibition features never-before-seen objects from the Metropolitan Police’s Crime Museum as it takes visitors through a series of real cases and tackles some of key challenges of policing in London – everything from terrorism and espionage through to counterfeiting and narcotics. The Crime Museum, which is now housed inside New Scotland Yard, was established in the mid-1870s as a teaching tool for police. Its Visitor’s Book contains some high profile names including that of King George V, Sir Arthur Conan Doyle – creator of Sherlock Holmes, illusionist Harry Houdini and comedians Stan Laurel and Oliver Hardy. Runs until 10th April. Admission charge applies. For more, see www.museumoflondon.org.uk. • Almost half of Goya’s surviving portraits are on show in The National Gallery in an exhibition which opened yesterday. Goya: The Portraits features more than 60 of the celebrated Spanish artist’s surviving portraits, borrowed from public and private collections around the world. 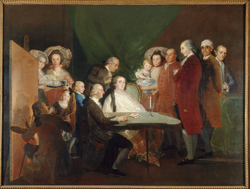 Highlights include the Duchess of Alba (a 1797 work depicting one of Goya’s patrons which has only left the US once before), the immense group portrait The Family of the Infante Don Luis De Borbon (pictured), the never-seen-in-public work Don Valentin Bellvis de Moncada y Pizzaro, the rarely exhibited Countess-Duchess Benavente, and the recently conserved 1798 portrait Francisco de Saavedra, exhibited for the first time in 50 years alongside a pendant painted the same year of Gaspar Melchor de Jovellanos. There are also works of royals including Charles IV in Hunting Dress and more personal works such as self portraits and paintings of his family members. Runs until 10th January in the Sainsbury Wing near Trafalgar Square. Admission charge applies. For more, see www.nationalgallery.org.uk. PICTURE: © Fondazione Magnani Rocca, Parma, Italy. • Black History Month is being celebrated in Trafalgar Square this Saturday in Africa on the Square, a programme of events inspired by the traditions and cultures of the continent. The line-up includes a musicians and singers, acrobats, dancers, a fashion show and a market selling African-themed products as well as a host of activities for families, from hair braiding and face painting to mosaics and batik making. There will also be a talent show giving aspiring performances aged between 16 and 25 the chance to perform in front of a live audience. The free event runs between noon and 6pm. For more, see www.london.gov.uk/africa. Of course The Crime Museum was originally established in the mid-1870s as a teaching tool for police. The training role must have been very important, especially when young inexperienced police recruits faced the daunting task of dealing with hardened criminals. Normally I would not be interested in a crime museum but my sons would have loved it and now my grandchildren will think it is super. If we miss it in The Museum of London, does the public have access to the Crime Museum inside New Scotland Yard?